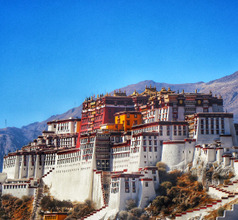 Lhasa City is also called the “land of the Gods” because it is located in the valleys of the mystic Himalayan Ranges. The city is the capital of the Tibetan Autonomous Region in China and lies at an elevation of 3,656 meters above sea level. It is the central point from where the numerous tourist attractions of the region can be accessed. The city also forms a convenient base to get acclimatized and prevent altitude sickness before attempting mountain climbing or trekking. The city lies on the banks of the Kyi Chu River which adds to its scenic beauty. 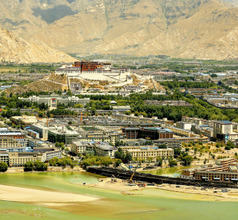 A majority of the domestic and overseas tourists visit Lhasa in the summer months when the average temperature is 24oC. The winter temperatures range between -7 and -10oC. 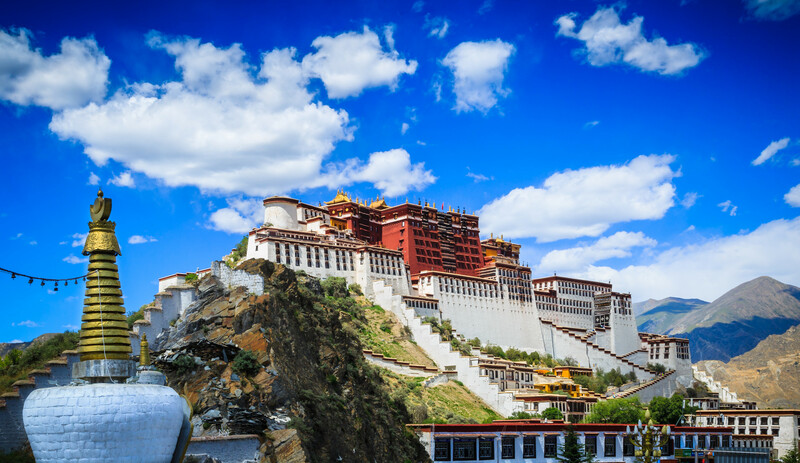 With a plethora of ancient monasteries, massive glacial mountain peaks, crystal clear rivers, lush greenery, ethnic culture, and breathtaking vistas, the city of Lhasa is indeed a very popular tourist destination! 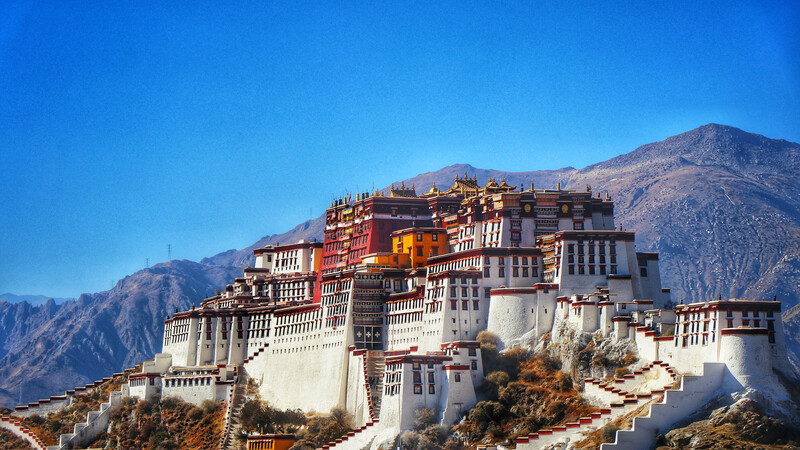 Lhasa City has been the heart of the Tibetan Buddhist culture for over 1,300 years. 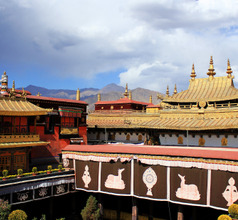 It has also been the capital of the Tibetan Empire for over 300 years. The city had always been the center of political, financial, cultural, and religious power in those days. 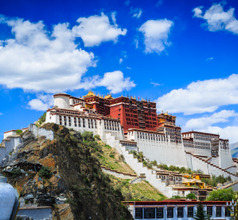 The magnificent Potala Palace, the seat of the 14th Dalai Lama, is not only a pilgrimage site for the Tibetan Buddhists but is also an architectural marvel that draws tourists from all over the world. 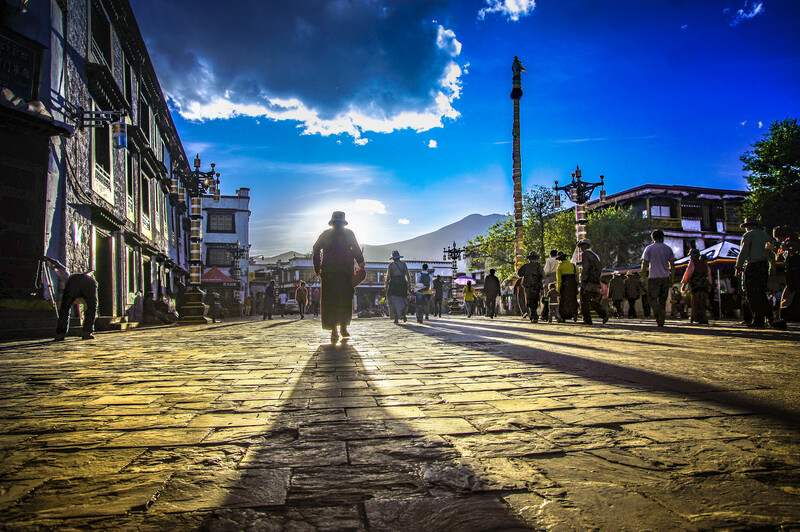 The modern-day Lhasa city is a pleasant mix of Tibetan Buddhists and Han Chinese people. 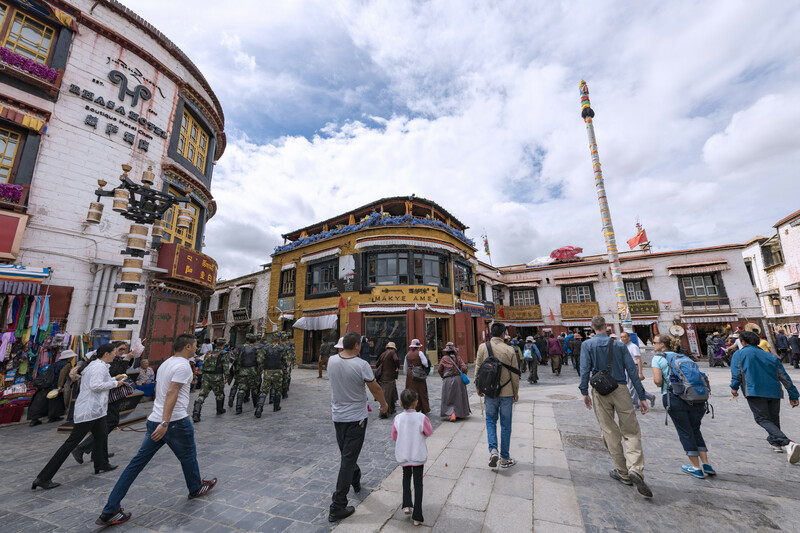 As far as the Tibetan’s are concerned, their lives are centered around the ancient Jokhang Temple, another holy pilgrimage site. On the other hand, the western suburbs of Lhasa City are mostly occupied by the Han Chinese. These parts of the city are more urbanized with plenty of commercial establishments, financial institutions, shopping areas, top-quality hotels, multi-cuisine restaurants, public transport services, and more. 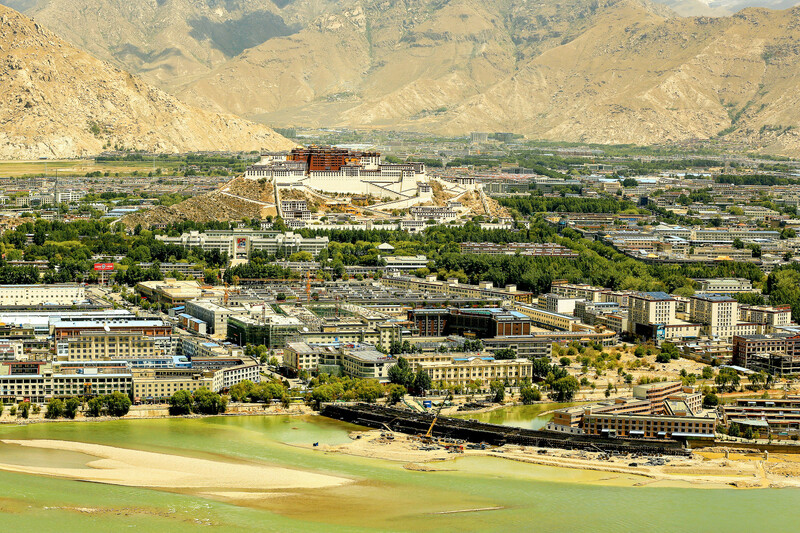 Being a semi-urban city, Lhasa has a good number of star hotels that provide tourists with spacious accommodation and aesthetic décor. They also offer various amenities to ensure that guests have a comfortable and luxurious time. The amenities vary depending on the star rating, but they usually offer in-house multi-cuisine restaurants and round-the-clock services like housekeeping, laundry, airport shuttle, customized sightseeing, etc. The low-budget accommodation usually comes with clean premises and limited amenities. One can choose from grade-one hotels, 2, 3, 4, and 5-star hotels, inns, guesthouses, and youth hostels according to one’s preference. The Tibetan Buddhists are pious people and there are many religious relics in and around Lhasa City. The grand Potala Palace is beautiful in every way possible. It is located at an altitude of 3,700 meters above sea level on top of the Red Mountain. Consequently, it is surrounded by the most picturesque scenery one can imagine! This 17th-century lamasery is 725 square meters in size and has wonderful architecture, built without disrupting the shape of the mountain. The Palace has a vast collection of ancient Buddhist statues and artistically painted murals. Norbulingka (or Summer Palace), an extension of the Potala Palace, is also an ancient architectural marvel and has been declared a UNESCO World Cultural Heritage Site in 2001. Next to the Red Mountain is the Chakpori Hill which provides a fantastic panoramic view of Lhasa City and its surroundings. The slopes of the hill have interesting Buddhist statues and scriptures carved into the cliffs. 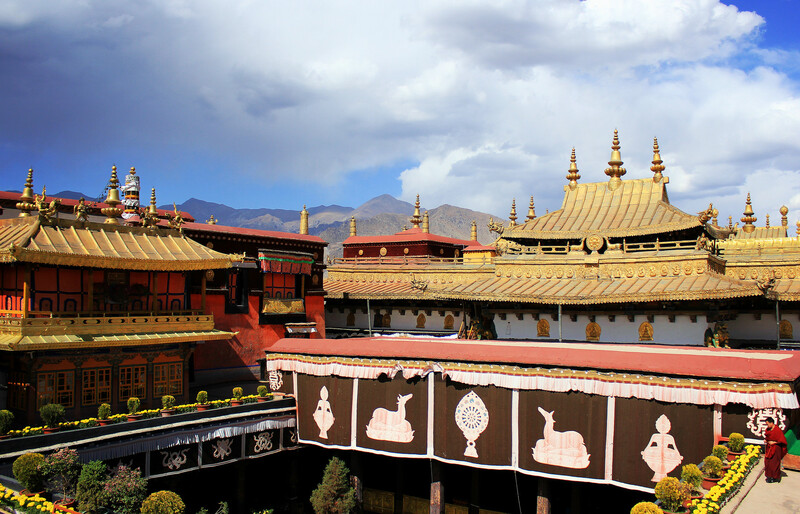 The Jokhang Temple has classic Tang Dynasty style architecture and contains a beautiful jewel-encrusted statue of the 12-year-old Sakyamuni Buddha. On the Tatipu Hill is the equally-famous Sera Monastery of the Gelugpa Tibetan Buddhist Sect (or Yellow Hat Sect). It contains superlative relics like scriptures written with gold powder, murals of matchless artistry, exquisite statues, and more. Belonging to the same sect is another famous temple, namely the Drepung Monastery. It is located just 5Kms from Lhasa on the Gambo Utse Mountain and has magnificent pagodas, caves, and prayer halls in its premises. A maximum number of Tibetan Buddhists from different parts of the world visit Lhasa during the Buddha Painting Unfolding Festival. This is the only time of the year when the painting of the Buddha is brought out for public viewing from the premises of the Ganden Monastery on Wangbur Mountain. Lhasa Gonggar Airport is built close to Yarlung Tsangpo River and 62 km from Lhasa, Tibet. There are 2 terminals, equipped with all modern necessities. 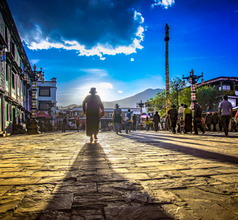 Popular routes are Chengdu, Chongqing and Xi’an though all major destinations are touched, in addition to the international destination of Kathmandu. Winters may distort schedules though. Shuttle bus is cost effective (RMB30) and takes about an hour to reach downtown. Taxis take the same time but cost upwards of RMB100. 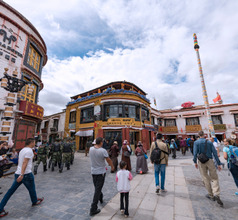 Besides Tibetan restaurants, the city of Lhasa has a number of places serving other types of cuisine keeping in mind large number of inbound tourists. So the western suburbs of Lhasa has plenty of Nepalese, Chinese, Sichuan, Western, and Indian restaurants. For those who like to try out the local cuisine will find the Tibetan food not spicy but full of calorific dairy products. Tsampa is the staple, which is roasted barley flour or wheat flour which is usually served with yak butter or yak-buttered tea. Other local specialties are Gyurma (yak or sheep blood sausage), Thupka (mutton or yak meat soup served with noodles), Tingmo (steamed bun stuffed with meat), Tsam-thuk (soup), Po Cha (yak-butter tea), Pinjopo (rice wine), chang (barley beer), etc.